While touring through Europe, I could not fail to notice all the various styles of crosses displayed everywhere on countless steeples and memorials. Most are obviously decourous, but one or two depictions struck me as being functional - but for what purpose? Crossed, Double Crossed, Nailing a Philosopher to His Own Cross. Until medieval times, any learned man was called a philosopher and good philosophers learned pretty much everything there was to be learned. The information explosion and the necessary specialization is a recent thing. Ancient philosophers learned about astronomy and navigation, in addition to classic literature, logic and mathematics. Knowledge of navigation was essential in ancient times not only for navigating at sea where the only features are the night sky, but also on land on the plains of Europe - especially in winter, where a miscalculation could mean a painful freezing death if you are trudging along and cannot find the destination village. There weren't any confusing brown tourist signs in those days and inuksuks are a Canadian invention! Only in the village of Lab in Slovakia, did I see a depiction of a philosopher carrying a light weight, but rather large (about a 1 meter long staff) cross and careful inspection of the painting showed some marks on the staff. At last, a practical Philosopher's Cross. The cross staff could have one, two or three cross bars (though only one would be used at a time). The staff was placed below the eye socket and staring directly into the sun, one could then measure the sun angle to the horizon, by moving the bar along the staff and then reading off the value inscribed on the staff. At night, the same method could be used to measure the angle of other well known stars, such as polaris. The angle would give the philosopher his latitude and a lode stone floating on a piece of bark in a ceramic bowl of water, would act as a compass and the combination, would show him which way to go. The whole process, would of course seem mystical and magical to commoners and a philosopher that could travel far and wide and navigate using the sun and other stars, was held in high regard. The cross staff, was in recent times replaced first by the back staff, a staff fitted with a little mirror and white board, which allowed the user to look away from the painful sun and later as technology kept improving by a more precise metal quadrant, followed by a precision metal sextant and nowadays a GPS receiver. I also saw many a staff with a spiral and a jewel in the middle as a prop used with many statues and even the modern pope and his bishops like to carry one (though I doubt that they have the foggiest idea how to actually use it). This jewel on a stick is the Philosopher's Stone, or a sun stone. Two small statues with these spiral staffs and also one little painting with a functional cross staff, are in the twin tower church in Munchen. That church is a particularly macabre place with the most horrific religious artwork on display - it looks like a place where Stephen King would go to get inspiration for his horror novels. 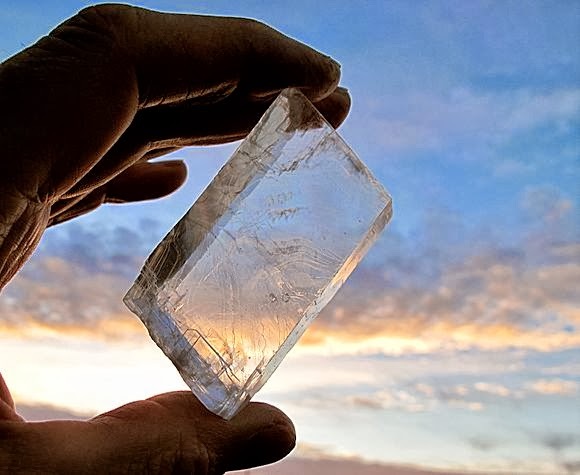 A sun stone, was a rare piece of feldspar, with parallel thin crystals, causing it to polarize light (just like a pair of polaroid sunglasses). When travelling in the extreme north, a polarized filter can indicate the position of the sun below the horizon. Inscriptions on the spiral, helped the philosopher measure the sun angle by looking at streaks of polarized light high in the sky while slowly revolving the stone. The philosopher could then navigate accurately using the sun, even when the sun was invisible. My father was a amateur geologist and collected stones. He had one of these and told me that it was used in medieval times for something, but he did not know what for. I played with it, but never thought of looking at the sky through it. If you live in the far north of Canada or Norway, give it a try with your polarized sunglasses. The streaks in the sky will be something else to look at besides the Aurora. Apparently, a sunstone was also useful to accurately find the sun on a cloudy day, so it is also a bad weather navigation tool, not just for use in the far north and probably prevented many a ship wreck. Nailing a Philosopher to His Own Cross, is a proverb indicating that the philosopher was refuted, but one cannot possibly nail a person to a cross staff - the thing is too small, light and fragile. It is a metaphor only. So, coming back to that well known religious icon nailed to his own cross, the blood, guts and gore. The simple fact is that the Romans did not nail people to crosses - it is too complicated to make one that would be strong enough. They simply impaled people on a stick same as Vlad The Impaler did with many thousands of Turkish invaders in Romania. The mythical icon, was only metaphorically nailed to his cross, but to make a practical statue, the light weight cross staff had to be made much larger and totally impractical and now we have tens of thousands of people wearing macabre icons around their necks, with hundreds of gothic churches displaying gory icons on decourous cross staffs with one, two or three cross bars all uselessly mounted at the same time, while precious few actually know where it all came from. (The little pictures are borrowed from all over the web - thanks to whoever took them - maybe one day, I'll upload my own).